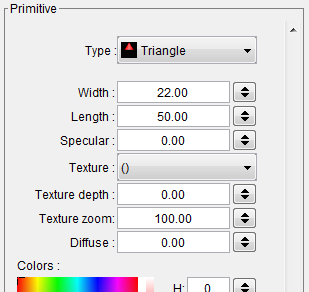 Primitive section parameters are altered with the primitive type. 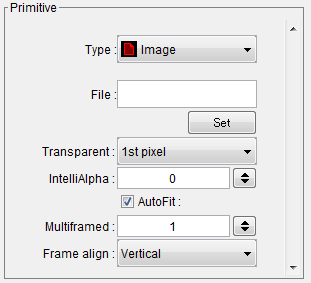 The 'Image' type primitive can load image from files. the original image is not limited in size and aspect. it would be a .bmp / .jpg / .png / .gif format. 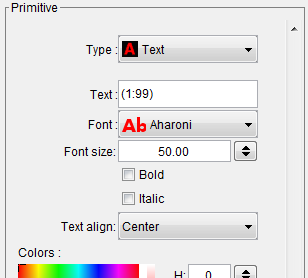 The alpha information can be used if loaded from .png file. Otherwise the top-left most pixel's color is processed as transparent. 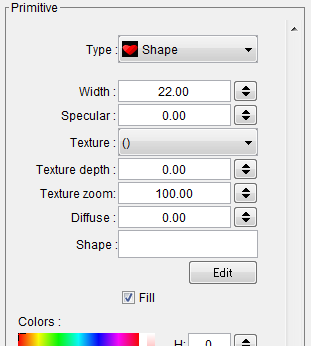 In addition, the 'Intelligent alpha' parameter can reduce the noise near the edge of shapes. The 'Intelligent alpha' will try to re-build alpha information from pixel color assuming the top-left most pixel color is the background color. For example, when a bmp file (red on white) with no alpha information is loaded on blue background, the edge of the shape will roil. Intelligent alpha will replace the 'how near to transparent color' to transparency. 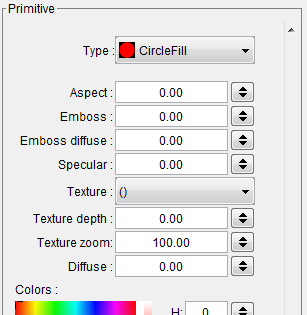 A circle without fill. 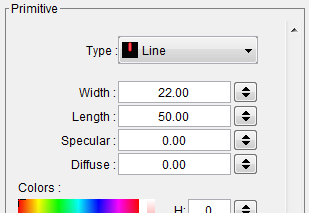 The 'Specular' parameter add a concentric speculation. A Filled circle. Probably most frequently used for the rotation type knob. Embossing and textures are available. This primitive has almost same statistics as CircleFill, but has a metallic speculations. 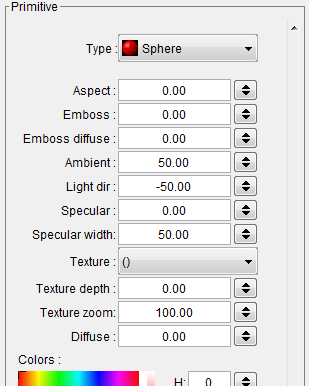 The speculation is controlled with 'Ambient', 'Specular' and 'SpecularWidth' parameters. Wavy shaped filled circle. 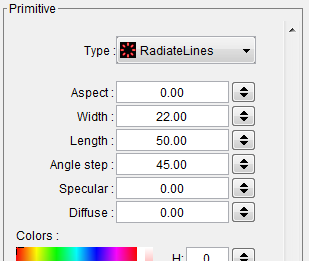 The 'Width' parameter can morph between circle/regular polygon/Star shape. A Sphere. Emboss and textures are also available. A rectangle without fill. 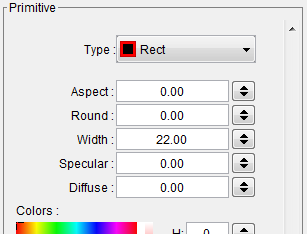 Roundness control is available. This primitive may be used for a slider type knob. A filled rectangle. 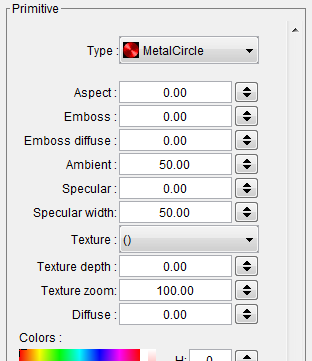 Roundness, Emboss and Textures are available. A filled triangle. May be used for the indication of the current position with 'Angle' effect. The triangle shape is controlled with 'Width' and 'Length'. The lines from circumference to center. This primitive may be used for the ticks around knob or a decoration of the knob body itself. 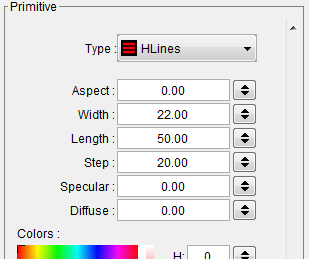 Multiple horizontal lines. This primitive may be useful for the ticks of the vertical slider type widget.